We love children. All of our audiologists are parents themselves, so we understand how to care for kids, and we know what it's like to be worried about your child. If your child has hearing loss, or your physician has suggested that you see an audiologist for any reason, we are happy to partner with you through this journey. We take a team approach to our pediatric practice. What that means is that you'll always have two audiologists working on your case. If you have any questions or need any help, we're here to support you. When you walk in, you'll find that our office is a beautiful, comfortable place, not a cold, clinical setting. We want every patient to feel at home, especially our youngest. We also aim to make the appointment itself as fun and comfortable as we can for children. That means that we turn our testing into games, which can help kids follow instructions and keeps the process from being scary. Your child won't feel like this is a doctor's appointment — it will feel like a nice play session with toys and dolls. 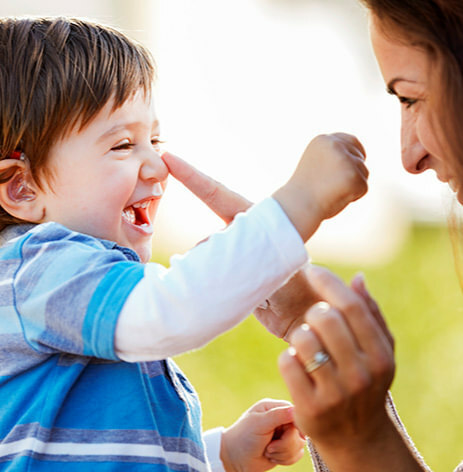 Along the way, we'll get a thorough understanding of your child's hearing. Physicians regularly refer their patients to us, and we value their trust. We'll collaborate directly with your child's doctor to make sure we know what their concern is. We're also part of your team, and we'll make sure we answer all your questions and explain everything we do and everything we learn. Sometimes it can be overwhelming if your child is sick or needs extra care, and we will take as much time as we need to answer all your questions so you know what's going on.